MarioKart is one of my favourite games ever. Since it originally came out on the SNES, I’ve loved zooming around the tracks (always as Yoshi), tossing turtle shells at people and avoiding the inevitable strings of bananas piled all over the track. Don’t tell Finland, but I’d rather play MarioKart than Angry Birds if given the chance! 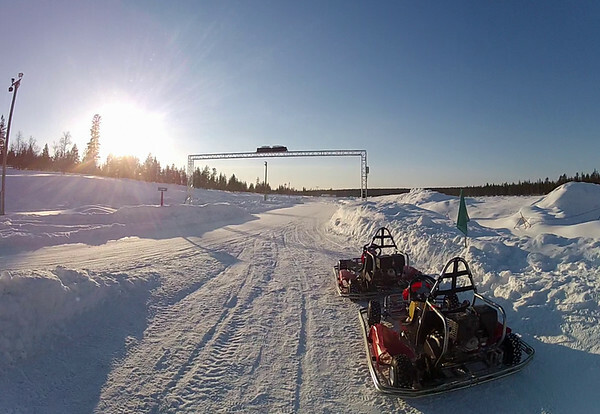 So, when I found out that ice karting is actually a sport that you can actually do in Finland, I got a bit giddy. How much closer could I really get to real life MarioKart without turning into a green dinosaur myself? 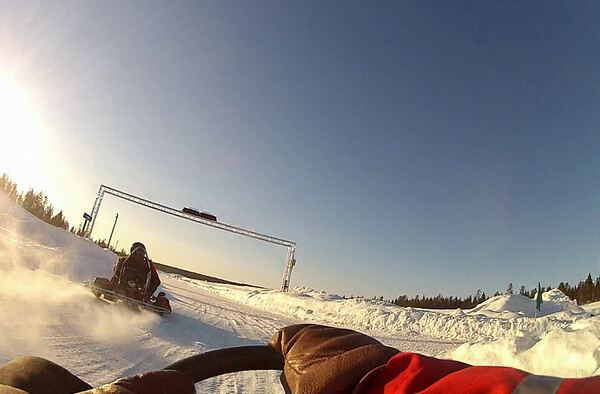 It’s not surprising that the ActionPark in Saariselkä offers ice karting. After all, they are a mecca for people who dream of taking the wheel of a rally car and skidding around on an ice track all day. 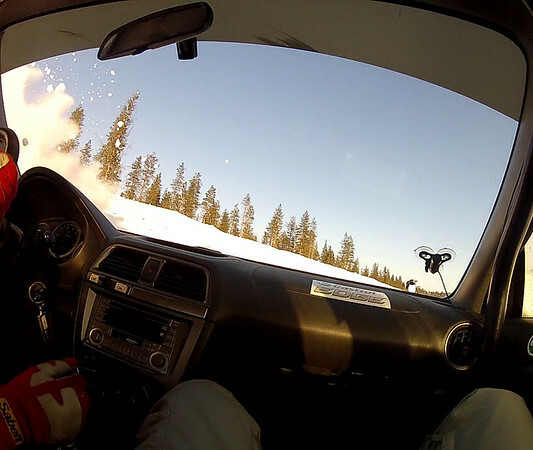 Throwing around some snow in a rally car. While I didn’t enroll in one of their ice driving programs, I did have a go at co-piloting in a rally car. I was a really helpful co-pilot, in that once I put on the helmet, harness, and microphone, I pretty much spent the whole five minutes that we whizzed around the ice track giggling my head off. Sorry the video is a bit low. It’s from a GoPro chest mount that I thought would be high enough but it clearly wasn’t. As we flew around the corners tail first, I grinned from ear to ear and wondered whether my own car, also a red Subaru Impreza, could ever do something like this when it struggles to get up some of the taller hills in Brisbane. In any case, I trusted Janne a lot more to pilot the car on the ice than I would ever trust myself in my own car! While it certainly felt fast — and a bit like a roller coaster — when we were in amongst the trees, I got a true taste of the speed of rally car driving when we went out on the open ice. All I could say was “Oh wow” as we took off down the track into the golden afternoon sun. With Janne after we made it around the track. As soon as I got out of the rally car, it was straight into an Arctic suit (which I was very quick at getting into by this stage in the trip), gloves, and helmet before being sent down the hill to the ice karting track. The ice karts looked just like the go-karts we used to race at birthday parties at Putt-Putt. However, they have been specially designed for winter driving and have had studded tyres fitted (just like every car in Lapland). This means you’ve got a bit more control than on, say, Sherbet Land in MarioKart where any little turn on the ice makes you go flying out of control. The ice karts lined up and ready to go. After being given the directions — left foot brake, right foot go, don’t press both at once, and don’t get out of the kart if you get stuck in the snow since someone will see you and come help — I was free to speed away. The course, which two guys were already skidding around, resembled Formula 1 more than Nascar (if either of those circuits ever decided to host a race on ice and snow). I drove a little cautiously at first but gradually threw that to the wind. What was the worst that could happen if I drove into a bank of snow? I’d have to wait to be towed out, like one guy that somehow managed to lodge himself on top of a bank did. As I watched the mini tow truck zooming down the track towards him, I thought of the dude that pulls karts out of the water in MarioKart and giggled to myself. Soon I was flying around corners, attempting to emulate Janne’s driving on a much smaller scale and hoping that I was leaving at least a little puff of snow in my wake. I clearly wasn’t going as fast as I thought since I got passed multiple times, but hey, it felt fast to me. It’s just unfortunate I didn’t have any turtle shells to chuck at the guys as they sped past! Where’s a red turtle shell when you need one? My ten minutes on the track flew were gone in a flash and I was left standing in the snow, wondering when the real world had started to move so slowly. I could easily see the lure in doing a rally car driving course — the exhilaration of being in a kart that was only clinging to the ice by a stud or two was addictive. The combination of it and the rally car drive put me on an adrenaline high for the rest of the afternoon. 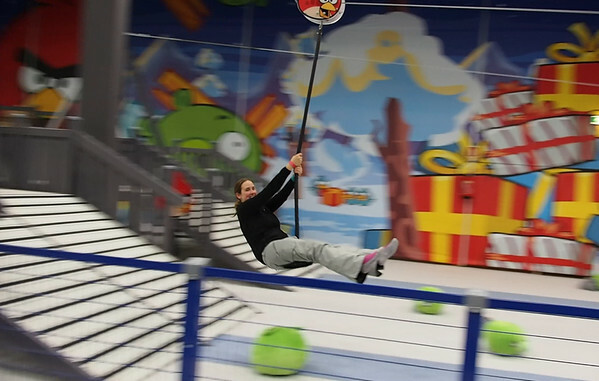 No wonder they say that everyone leaving the ActionPark has a smile on their face! Would you try ice karting? What about rally car driving on an ice track? I visited ActionPark as a guest of Hotel Kakslauttanen and Northern Lapland Tourism but all opinions stated here are my own. ActionPark is located in Saariselkä in Finnish Lapland. Throughout the winter, ice karting and rally car driving are available from 4-6pm with no reservation required (unless you’re in a large group). I’d suggest getting there early because you might want to stay awhile! That looked like a lot of fun and brings a new dimension to karting. The car also looks very powerful too.